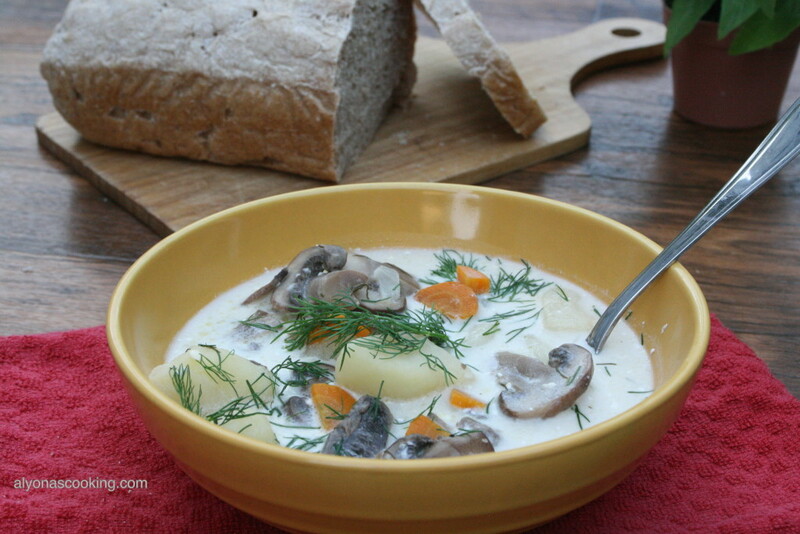 This is a very quick and easy mushroom soup. Most ingredients are probably something you already have in the fridge and if you prepare the vegetables beforehand this soup can be ready as soon as the potatoes are done (20 min). This recipe was adopted from my mother in law who originally gave me the general idea (I just added sour cream, carrots and the mushroom bullion cube to her recipe, which by the way if you even make this without the three ingredients it will still be as good). Anytime I need to make a mushroom soup this is the recipe I reach for. Try it! Dice onion, chop the carrots and potatoes. Sauté the onion and carrots in a lightly greased non-stick skillet over medium high heat until tender; add the mushrooms and continue to sauté until mushrooms shrink in size. 4. Add the cream cheese and sour cream to the mushroom sauté and stir until bubbly and smooth. Add the heavy cream and continue to simmer. 5. Meanwhile fill a large pot with water about half way full (a little less than half since water will rise after you add the veggies and potatoes) and bring to a boil. Once water has boiled add potatoes and chicken bullion cubes. 6. Then add the sautéed mushroom mixture to the potatoes and continue boiling until potatoes are tender (20-25min). 7. Turn off stove and add dill. Dice onion and carrot. Cube potatoes and set aside. Heat a large skillet over medium high-heat with a few tbsp of oil; sauté onion and carrot until tender; add mushrooms and sauté until mushrooms have reduced in size. Str in 1 mushroom bullion cube, cubed cream cheese and sour cream to the mushroom mixture, stirring until cheese melted and bubbly. Add heavy cream and simmer. Meanwhile bring a large pot of water to a boil (about 12 cups of water); add potatoes and 2 chicken bullion cubes. Add the mushroom mixture, vegta seasoning, salt and pepper to the potatoes and continue boiling until potatoes are tender. Turn off stove and add dill to the soup. This is the best mushroom soup recipe out there. Came out so delicious. I agree, this is a great recipe!